In some cases, purchasing a stairlift is not always the best option. Often people don’t need a stairlift for long periods of time or maybe they don’t have the funds. Dolphin Stairlifts recognises this and can offer stairlifts to rent or hire. You only rent or hire the stairlift for as long as you need, maybe whilst someone in your home is recovering from a short term illness or injury. For a small initial charge, we will install and remove the stairlift when it is no longer needed, we then ask for a monthly payment to cover the hire of the stairlift. A rental stairlift can normally be installed within a couple of days and takes only a few hours to complete. Whilst a stairliftlift is being rented, we will fully maintain and service the lift as part of the rental cost so there is nothing else to pay. All breakdowns are fully included within the monthly rental. 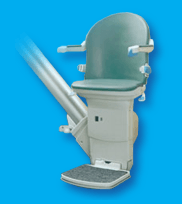 There is no fixed or minimum term, when the stairlift is no longer required you can contact us and we will arrange for an engineer to remove the stairlift promptly.